West Crete is full of unique gorges waiting for you to explore. If you like hiking the Sirikari Gorge is one that you should definitely visit. It starts from Sirikari village and goes to Polyrinia village and it is considered to be easy and safe for the whole family! 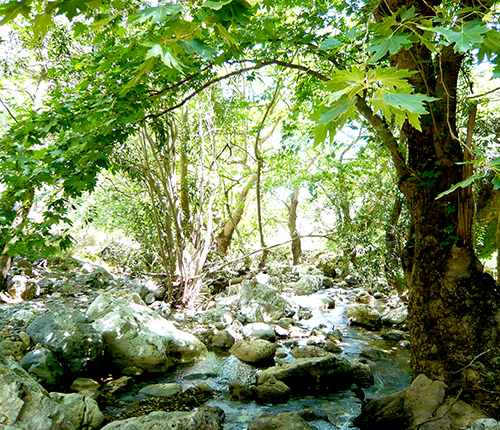 It is one of the most scenic gorges of the area with reach flora and fauna and it is characterized as a national park. You can start your day in the morning and visit some traditional villages to the way to Sirikari. 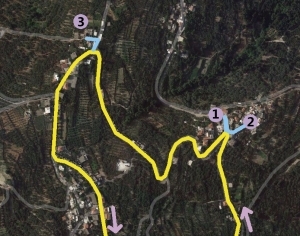 You pass through Kaloudiana, Potamida, Voulgaro and then in Topolia you turn right towards Ai-Kyryiannis, Kalathenes and then Sirikari. Sirikari is about 18 km away or about 40’ drive. In Kalathenes you can stop to see the village, drink your morning coffee to the coffee shop (kafenio) in the small square under the Venetian Governor of the area Headquarters of the area whose architect was Onorio Belli (1), see the old buildings of the village (2) and then move to the next neighbor Rotonda. In this neighbor, Onorio Belli, who was close friend to Andrea Palladio began to build Villa Rotonda (3), a palace for the local governor. Click the thumbnail for biger image. Detailed presentation of a walk in Kalathenes village can be found in our article “Kalathenes, the traditional Cretan village with a Venetian touch!”. 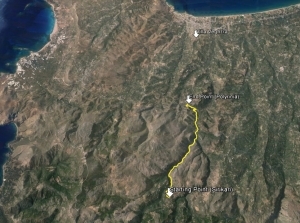 Once you reach the first neighbor of Sirikari the entrance of the gorge is opposite the Ekklisia Agios Konstantinos (Church of Saint Konstantinos, coordinates: 35.419618, 23.641301). In the beginning of the gorge there is a forest of chestnut trees and the entrance is a bit thin and descending among olive trees. After a while you will reach in a wider path by turning right. There are also some ruins to explore! From that point the gorge begins and goes for the next 5,6 kilometers or 2,5 hours. You will see many birds while walking. There is also a protected species of eagle living there. After a while you will reach a very old packhorse bridge which is one of the hot-spots of the whole route. After a while you will meet the paved road of Polyrinia( coordinates: 35.454236, 23.649481). 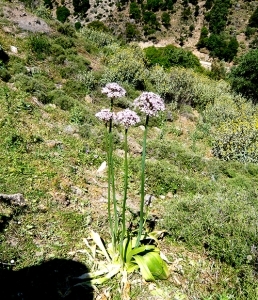 Polyrinia was a Roman City 6 kilometers from Kissamos. Old city walls can be found there, an old tower and Christian Church of Agioi Pateres (Holly Fathers) that was built with the ruins of an ancient temple which is located to the Acropolis of the village. There is also a tavern that you can have your lunch and leave your car to enter to the Acropolis. Detailed presentation of Polyrinia will be posted in the blog in the future. 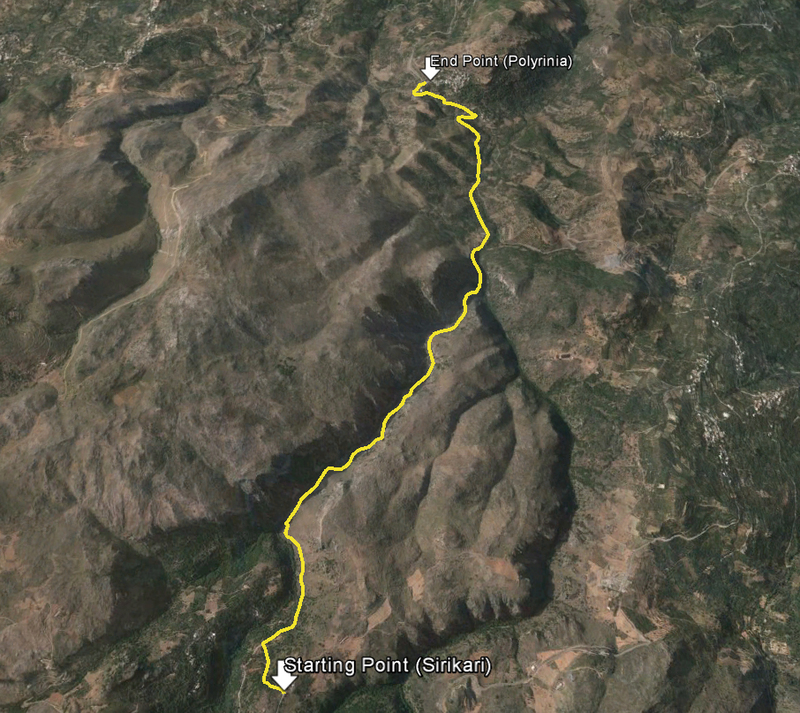 If you decide to do it let us know in order to assist you with the drop off to Sirikari and pick up from Polyrinia. Distances are short and everything can be handled easily!